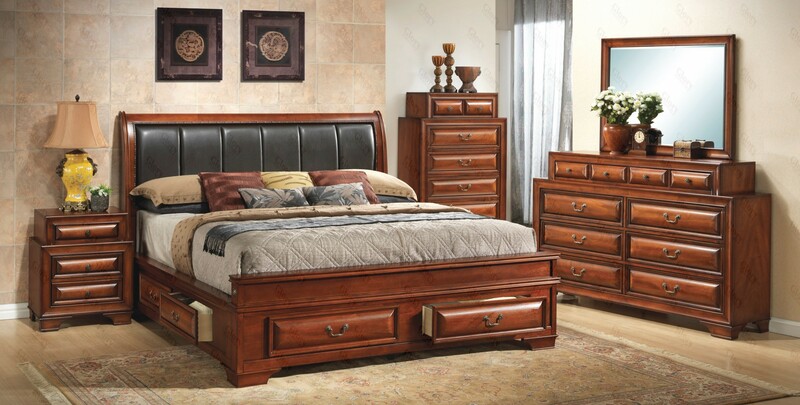 Buy this Wood Finish Brown Bedroom Set G8850C from Glory Furniture and give your bedroom a majestic and grand touch. Made of high quality solid wood, the bedroom set is very sturdy. 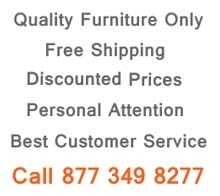 It offers perfect solution for storage with two drawers on either side and two front drawers. The bedroom contains a bed, a dresser with mirror, a chest, a TV dresser and a nightstand. The wooden drawers help to keep your things organized. The black leather upholstered headboard not only offers comfort to the user but also enhances the overall look of the bed. The bed comes in King and Queen size. The dresser is attached with the mirror and offers several drawers to keep your cosmetics and other essentials. The dresser and the chest give enormous space for everything. Brown color has a very warm feeling. The bed set design is certainly impressive and one of a kind. The chest too offers a perfect place to keep all your valuable stuff and the nightstand has two drawers.